Pierre Feyler studied in the Academie de l’Orchestre and at the Banff Center School of Fine Arts in Canada and then decided to pursue a career mainly in Chamber Music. During his studies he was influenced by some of the finest double bass players. He was a founder member of the La Bruyere Ensemble and created the Trio Sonata Concert in 1987, for which he commissioned works from several composers. As a member of this ensemble he toured in Europe, in Japan, in Moldavia and in Canada and made several recordings under the VDEGallo label. He also made recordings of contemporary music both as a soloist and as a member of small groups.He is regularly invited to play in several national orchestras and also teaches at the Ecole Nationale de Musique d’Evry (France). Pierre founded the Winter Concert Festival in Meriel, outside Paris, in 1999 and has been its Artistic Director together with Francoise Perrin ever since. 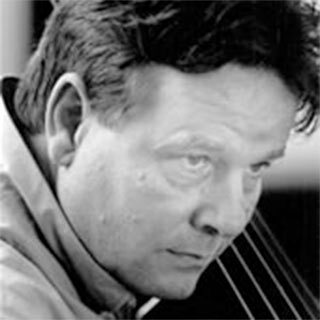 In 2001, after meeting the theatre director Rene Alboid he composed and played a solo piece for double bass for “Cendres de Cailloux” (Pebble Ashes), a play written by Daniel Denis which has had over fifty performances in France. He wrote a further piece for violin and double bass for J.L.Lagarce’s play “Noce” in 2004. He appeared in “Phedre et Medee” with Fanny Ardent and Sonia Wieder-Atherton in 2005. The following year Pierre wrote five sketches for double bass and orchestra and renewed his continued to work with R. Alboid in a production of “Mathilde Sincy” by D.Chryssoulis with music for violin, double bass and piano. During this time he continued playing in orchestras and chamber music groups as well as in the recording studio. Pierre Freyel composed four melodies for some of Emilie Rivenq’s poems in January 2008 which were performed the following month by Nicolas Rivenq (baritone) and Bruno Gousset (piano). Sketches for double bass and piano are to be written and performed in Saint-Roch and Trinite Church in Paris on the 25th and 30th November 2008.